Discussion in 'UKBF Marketplace' started by UniHost2u, Nov 25, 2018. On Black Friday & Cyber Monday , ThemeLooks announces impressive discounts from up to 70% on their items for a very limited time !!! So this is the best opportunity for you to grab them at a low cost !!! Premium WordPress and whmcs Theme Club. Not Any Hidden Charges! Over 1,000 Customers Trust Us, Why won’t You? ThemeLooks is known for developing professional WordPress WHMCS theme and HTML5 Website template and they have themes and templates in different categories. So if you are a business person planning to feature your organization by creating a unique website, you are absolutely in the right place. These WordPress theme and Website template generally come to be used for different purposes like domain and hosting business, Cryptocurrency, VPN, Technology and many more. Most of the themes can be used for multipurpose use which will make you build any websites in any categories by using just a theme. They are fully customizable from header to footer which will give you the opportunity to build your website just how you want. By their exciting design and wonderful features, you will be able to build a great website which will give you a boost start into your business. Moreover, most of them have the best e-commerce plugin integrated into it by which you will be able to use all the e-commerce features as well and convert your website into an online shop. The unique pricing table will help you represent your pricing plans very professionally. Custom Layouts can be created very uniquely by your choice and can be used in any pages that you want. The drag & drop page builder will give you the opportunity to build web pages faster than ever. 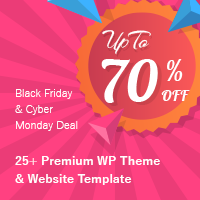 So if you are looking for premium WHMCS theme , WordPress WHMCS theme and Whmcs template at a reasonable price, this is the best opportunity for you to grab them!